‘Wynola’ was the home of hardware merchant Leonard Keep and was located on Chalmers Road, on the western side between Barker Road and Newton Road. It was later known as “The White House”. The house was built c.1894 and was demolished c.2007. The site was then subdivided into a number of residential building lots (15-17 Chalmers Road). 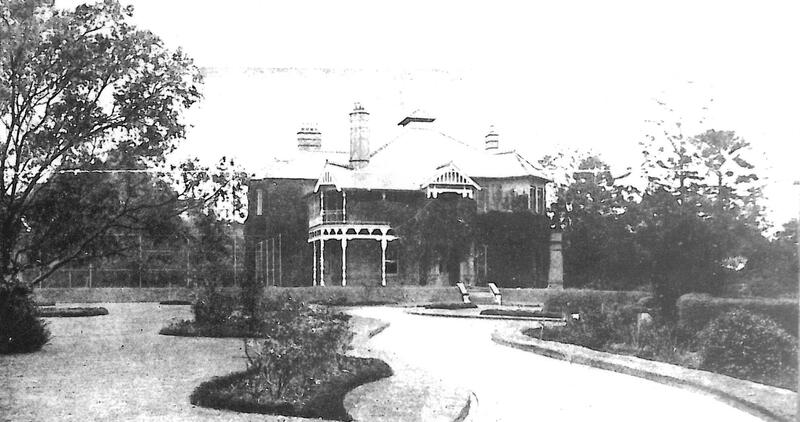 Keep (1858-1924) was the third son of John Keep, of Broughton Hall, Leichhardt. John Keep was a cousin of the British Keep Brothers Ltd. He had his training in Birmingham and Leicester and then migrated to Australia. John Keep founded the hardware firm of John Keep and Sons Ltd in 1853 on the south-westen corner of George and King Streets Sydney. The business moved to Barrack Street (now the site of the former CBC Bank, which is on the State Heritage Register), then Clarence and King Streets. The business was destroyed by fire in 1919 and was moved to Sussex Street. In 1893, the firm was made into a limited liability company and John Keep and his sons Leonard and Walter became directors. John Keep died in 1905 and Walter Keep was appointed chairman. Leonard Keep succeeded his brother as Chairman in 1922. Keep was educated at King’s School, Macquarie Fields, and King’s School, Parramatta, and later on the Continent. In 1876, he joined the firm of John Keep and Sons Ltd. In 1922, following the death of his brother Walter Keep, he became the managing director. Leonard Keep was presídent of the Concord Golf Club. Keep married Jessie Evans. His three childre included J. L. Keep (a later Director of the firm), Mrs. R. Scott, of Bombay. and Mrs. G. H. Wharton, of Queensland. Keep died suddenly at ‘Wynola’ on 27 December 1924 at age 66 years and is buried in the Church of England Cemetery, Rookwood. In 1927, the firm of John Keep was amalagamated with Holdsworth, Macpherson, and Company, Ltd. The company of Keep Macpherson Ltd was delisted from the Sydney Stock Exchange in 1931. Following Keep’s death in 1924, the grounds of ‘Wynola’ were subdivided into 16 residential lots facing facing Barker Road, Newton Road, Yarmouth Street (later Wallis Avenue) and Chalmers Road. Though this substantially reduced the grounds of ‘Wynola’, the house was still situated on a large allotment measuring over 4000 square metres. 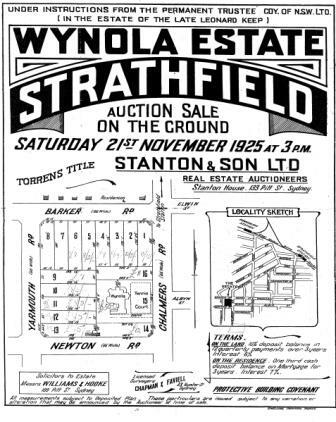 The subdivided lots together with the house and tennis court was auctioned as the ‘Wynola Estate’ in 1925. The advertisement described the house as ‘brick residence on stone foundation with slate roof. On the Ground Floor, the accommodation comprises: Wide lounge hall and entrance hall with open fireplace, drawing room, dining and smoke rooms, billard room, ballroom (about 60″ x 25), retiring rooms and orchestra dais, butler’s pantry, larder, storeroom, built-in glass cupboards, large kitchen, laundry, fuel range, scullery, second kitchen, wood and coal house. The ‘White House’ Chalmers Road 1986. Strathfield Council photograph. ‘Wynola’ was later known as the ‘White House’. The original house was brick finished but at some stage, the house was rendered and painted white, hence the name the ‘White House’. 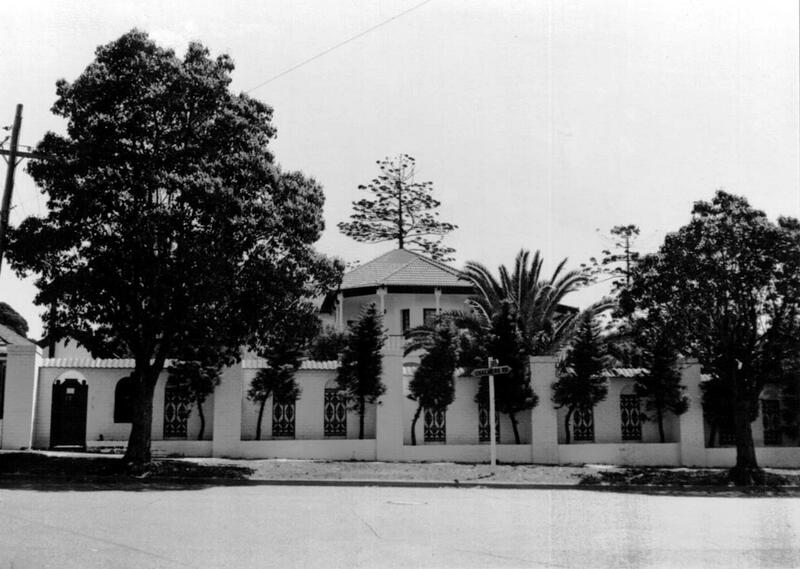 The ‘White House’ was identified in the 1986 Strathfield Heritage Study as a potential item of heritage significance, however the house was never heritage listed. Another good article. My memory of the alterations of ”Wynola” into ”The White House” are that they occured in 1977/78. The house had been the Sydney Bible Training Institute prior to that and up until the 1950s had been home to the Friend family. I’m not sure which family branch lived in it but they were connected to Walter Smale Friend who the gym at Kings is named after. Although the house was somewhat ramshackle in the 1960s it was a huge shame that it was mutilated by the Bullens. It would be interesting to see your article with some more post 1920s information added as the house was always a major landmark. Thanks again. The alterations occurred in the late 1970s and you are right that it was once the Sydney Bible Institute. Some people found the house imposing and iconic after the renovations (the “white house”) but the house was badly altered and completely changed beyond recognition. My parents bought the house in 1977 after it had been totally renovated & modified by the previous owners, they also added the 2 swimming pools & island fish ponds etc. It was our family home for 25 years. House was demolished and land sub-divided by developers after it was sold in 2001. The Bullens did nothing to the house. Please can you explain what you mean?? I never made any comment about the Bullens. The comment I made was that some people found the house imposing and grand, while others didn’t because the house had been substantially altered. The alterations to the house was the main reason it was never heritage listed. I thought the comment was in response to my article, hence my reply. This house belonged to the Bullens .. I remember spending one of my Christmas Days here .. many years ago . fond memories .. It was a beautiful old house . Sad to hear it is gone .